Suppose you wish to visit a point half way up a conical mountain. The question is -- what path would you choose? One could use the shortest path from your base at ground level expecting to save time and energy and build the shortest road/railroads for cars/trains to travel on. But is this feasible? - Apparently not, as the slopes one would face are just too high for all forms of transport. Ever wondered why mountain roads generally loop round? This is to manage the slope of the road that you can bicycle on, or drive a car. In this blog, I shall analyse the design considerations of a mountain road with a reasonable slope and calculate the length of the road required to visit a point half way up the mountain. 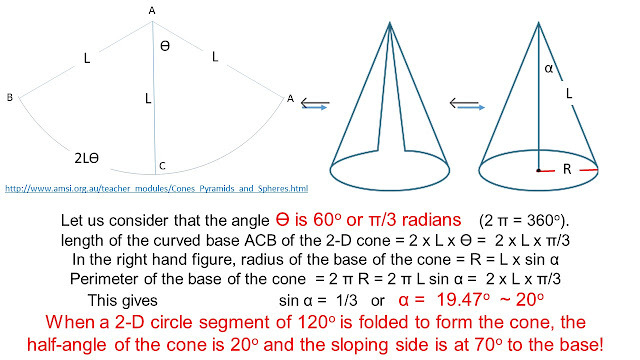 We shall learn some interesting properties of cones using geometry and school level maths. 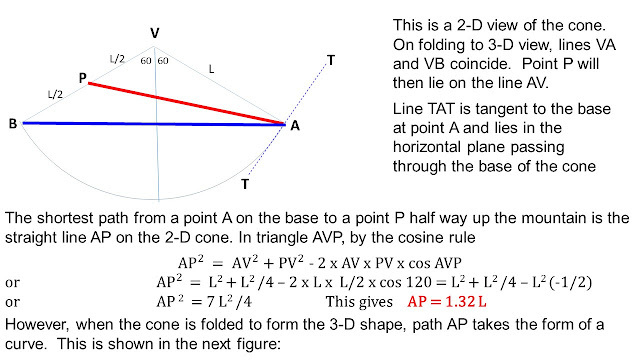 As shown in the figure, we can 'develop' a 3-D cone into a 2-D surface -- this makes life much easier. For a right circular cone of slope length L, the 2-D shape is a segment of a circle of radius L. For ease of discussion, let us consider that the segment subtends an angle of 120 degrees at the centre of the circle. 1 radian is 180/Pi degrees where Pi = 3.142. 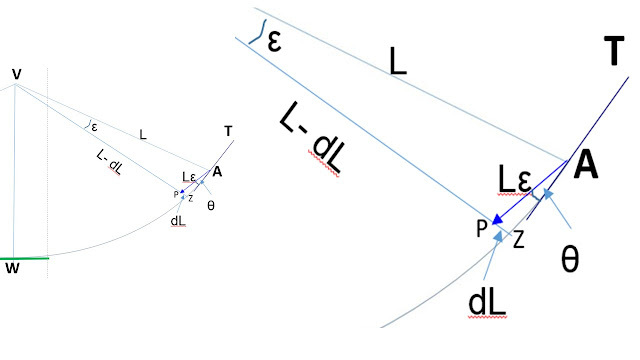 Notice, how the path to point P (shown by the red curve) starts at a steep angle of 60 degrees from the horizontal plane (plane for the base of the cone). The path also goes uphill beyond point P and then reaches P through the downhill part. Even if we were to take the shortest path from A to return back to A (path AB in the previous figure), it will follow the green curve with a slope of 48 degrees. 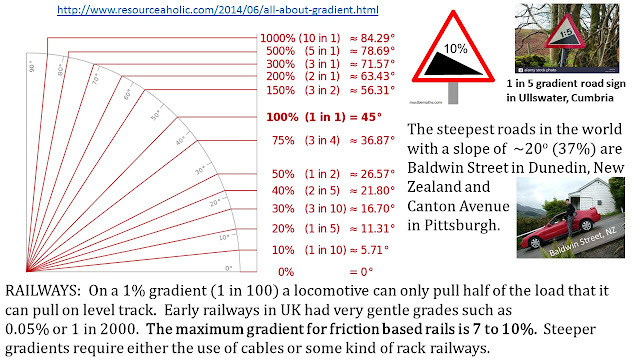 These slopes are absolutely too steep for any transport and impractical for that reason. As discussed previously, on folding the 2-D template, the circular segment BWA, becomes a closed circle and sits on a horizontal plane while radii VB, VS, VQ etc. lie on the sloping sides of the cone. Paths from A (AB and AP) make different angles with these radii as one moves away from point A. Path AB: The path starts pointing upwards with a positive slope relative to tangent at A. The tangent lies in a horizontal plane. This angle decreases until point F where the path is parallel to the tangent at W - here the path has zero slope. Beyond point F, the path has a negative slope as shown in the figure. F is the midpoint of path AB. 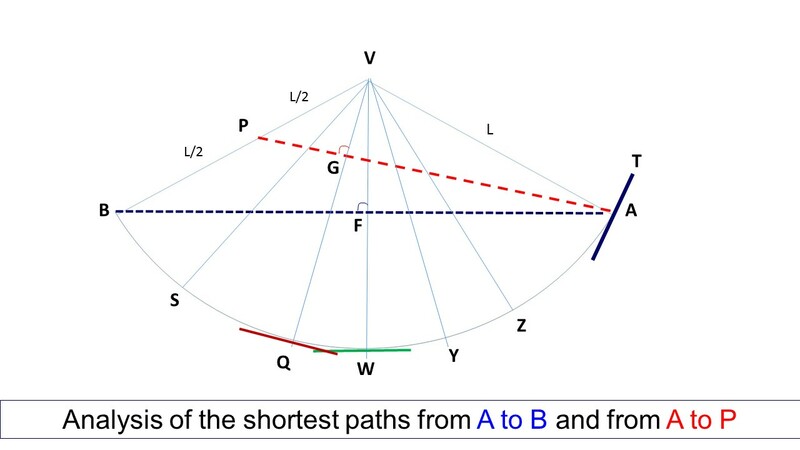 Path AP: The path follows same pattern as path AB but now the path has zero slope at position G, and the portion GP has a negative slope (goes downward). 2. A Realistic Solution: To construct a path that most modes of transport may be able to use, let us first look at how slopes in roads are defined and what the maximum slopes on existing roads are. 2. A constant Gradient Path: We shall now consider a realistic path that cars can travel and shall choose a gradient of 1 in 6 (1:6) or approximately 10 degree slope of the road. 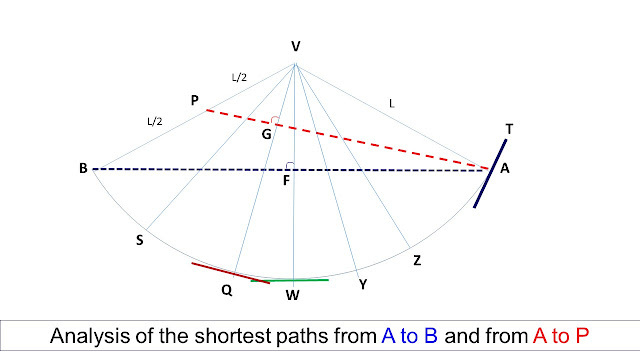 The path makes an angle of ~10 degrees (1/6 radian) with the horizontal (base of the cone) throughout the ascent. In the figure below, this is represented by the Greek letter theta (Θ) i.e. Θ = 1/6. S1 + S2 = Lε + (L - dL)ε = Lε + (L - L εΘ)ε = Lε (1 + (1 - εΘ)). Now we are ready to calculate some numbers. ε =1/57.3 radian; Θ = 1/6 radian and N = 120. 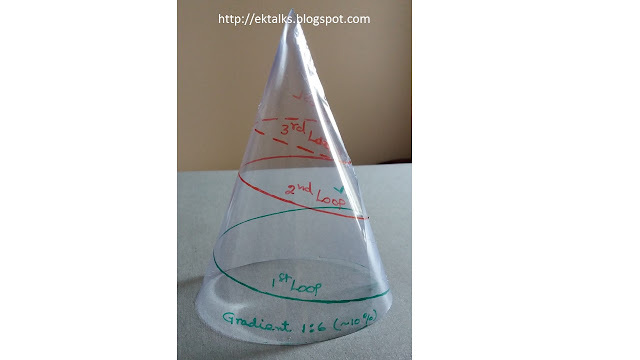 The circumference of the base of the cone is L times 2Pi/3 = 2.095 L.
After one round, the car has moved up 29.5% of the slope towards the vertex of the cone and travelled a distance of 1.77 times the length of the slope. If we continue to a second loop around the cone then an exactly the same analysis can be carried out but with the starting value of the slope length appropriate for the remaining cone. Alternately, we can use equations 4 and 5 with N = 240 to represent two loops. Some points to note here: The choice of ε equal to one degree angle is quite good. I checked by using ε = 0.1 degree and the result does not change suggesting that the calculation is secure. Also, I have chosen a slope angle of 1/6 radian (about 10 degrees) that I think is realistic. The method described above should be accurate up to a slope of about 20 degrees. 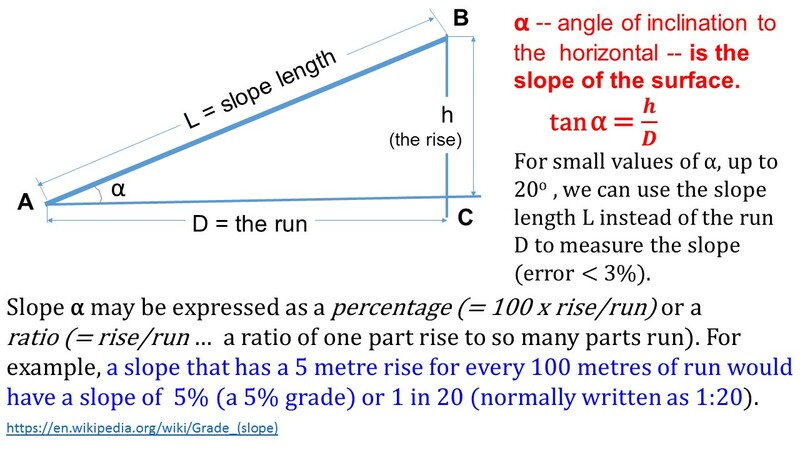 For more steep slopes, it will be better to use actual trigonometric relations but that will make the analysis more complicated - and also then road gradient less practical. Interestingly, our choice of a 1:6 gradient takes the car to the half way point in two loops. Of course, one can use equation 4 and calculate the gradient of the road required to reach a certain point on the mountain after a given number of loops. For example, if we wish to reach the half way point in one loop, the we can use eq.4 for H = 0.5 L and find Θ (the slope required). Simple calculator work gives Θ = 0.33 radians or 18.9 degrees. 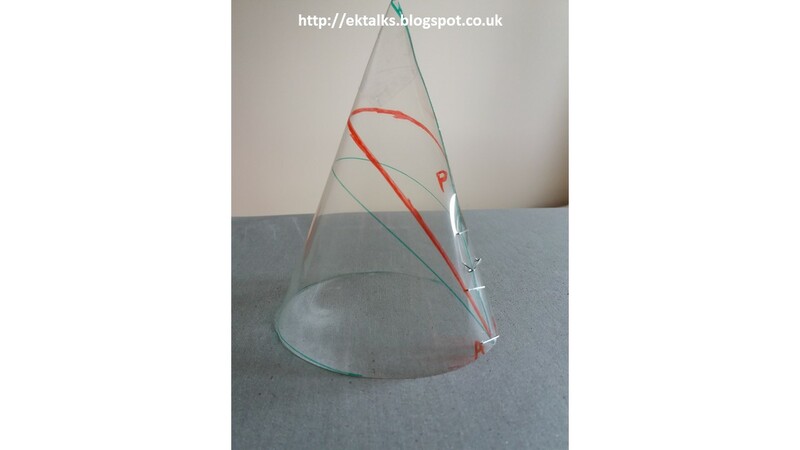 Eq.5 then tells us that the length of the path S = 1.515 L.
Hope you have enjoyed reading this blog and feel more comfortable about analyzing conical structures.